Called variously the ’Byzantine epic’, the ’epic of Modern Greece’, an ’epic-romance’ and ’romance’, the poem of Digenes Akrites has, since its rediscovery towards the end of the nineteenth century, exerted a tenacious hold on the imagination of scholars from a wide range of disciplines and from many countries of the world, as well as of writers and public figures in Greece. There are many reasons for this, not least among them the prestige accorded to ’national epics’ in the nineteenth century and for some time afterwards. 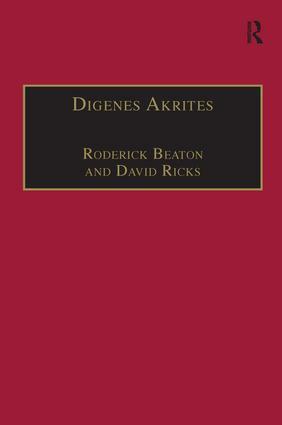 Another reason must surely be the work’s uniqueness: there is nothing quite like Digenes Akrites in either Byzantine or Modern Greek literature. However, this uniqueness is not confined to its problematic place in the literary ’canon’ and literary history. As historical testimony, and in its complex relationship to later oral song and to older myth and story-telling, Digenes Akrites again has no close parallels of comparable length in Byzantine or Modern Greek culture. Whether as a literary text, a historical source, or a manifestation of an oral popular culture, Digenes Akrites remains, more than a century after its rediscovery, persistently enigmatic. This Byzantine ’epic’ or ’romance’ has now become the focus of new research across a range of disciplines since the publication in 1985 of a radically revised edition based on the Escorial text of the poem, by Stylianos Alexiou. The papers in this volume, derived from a conference held in May 1992 at King’s College London, seeks to present and discuss the results of this new research. Digenes Akrites: New Approaches to Byzantine Heroic Poetry is the second in the series published by Variorum for the Centre for Hellenic Studies, King’s College London.